Traffic- free and on the level, this section of the 180 mile "Tarka Trail" runs betwixt the B3233 and the River Torridge on what was once the Old Bideford to Barnstaple Railway line. We can't guarantee you have as exciting a journey as "Tarka" but, nevertheless, this is a great opportunity to appreciate the stunning estuary views, get out in the open air, enjoy a walk or a cycle ride with the whole family. Bracing in autumn and winter or a chance to cool off on a hot summer's day, this part of the Trail can be enjoyed by all ages. If you are walking, we recommend you set out from Bideford Station and take the opportunity to look around the Railway Museum. The Old Railway Carriage is open for refreshments from Easter to October. There is a good view of the port of Bideford and its ancient long bridge from the top of the old railway bridge. If you are lucky the famous schooner , "Kathleen & May", will be alongside Brunswick Wharf, look out for her tall masts from the trail. Further along the track you pass under the massive Torridge Bridge which spans the estuary. Over to the right on the hillside you can see the tower of the 13th Century Church of St. Peter situated in the village of Westleigh and looking upwards straight ahead you can just about make out Tapeley Manor, home to the Christie Family. The 20 acre gardens at Tapeley Park were created in the 19th century by Sir John Belcher. On the opposite bank the huge metal structure is Appledore Ship Yard now thankfully in production again after its recent closure. 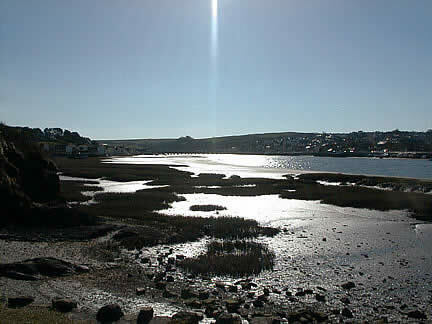 Where the Two Rivers meet, two villages nestle beneath two hillsides on either side of the estuary, the busy fishing village of Appledore and the elegant village of Instow. The old railway platform is still at Instow but the station is now home to the North Devon Yacht Club. The level crossing gates and the award winning Signal Box, which is now a listed building, are kept in pristine condition. The trail continues through the Level Crossing but rest a while in Instow Village, you can pick up the trail again between the sand dunes at the other end of the beach. This will give the children the opportunity to kick off their shoes and build sand castles. The village stores have a delicious selection of ice creams or if you have built up a real appetite there are a variety of places to eat along Marine Parade or the promenade including the prestigious Commodore Hotel. The trail carries on through Yelland, Isley Marsh Nature Reserve, Fremington Quay and Barnstaple. It must have been a great train ride!